So you have a brand new computer, a keyboard controller, microphones, sample libraries and some nice monitor speakers; but what is missing? ; an audio interface. We sometimes take audio interfaces for granted, but that is a big mistake. Everything coming in and out of your computer DAW has to pass through that same somewhat forgotten interface, that is why it is so important to select the right one. PreSonus has been manufacturing some of the best sounding and user friendly audio interfaces and mixers in recent years. Their latest release introduces a new set of powerful interfaces that will become the cornerstone of your music production setup. Following a tradition of roadworthy build quality you will notice how solid (and I mean solid) the Studio 6|8 is. The clear color scheme and controls are a very welcome feature. Looking closely you will see MIC/LINE/INSTRUMENT combo jacks for inputs 1 and 2. Plug in a mic and you engage the top quality XMAX preamps. You can also connect a guitar and would be good to go not needing to go through a direct box first. Line level sources are not a problem either, you just engage the Line selector and off you go. 48v Phantom power is also controlled by a front panel selector. Dominating the center of the Studio 6|8 are very attention getting INPUT and OUTPUT LED meters. These are so great for allowing you to get a visual representation of your signals going in and out of the interface helping you to maintain optimal levels. The two buttons on the other side of the meters focus on monitoring. The A/B button switches the headphone output between outputs 1-2 and 3-4. This is great for comparing how the different mixes sound. The last of the front panel buttons MON allows you to listen to the LIVE input mixed in with the audio coming from the computer. This is a convenient way to monitor track playback from your DAW while adding new parts. Moving on you have your INPUT LEVEL adjustments (inputs 1 – 4) along with MAIN and HEADPHONE output level controls. All of the controls like the rest of the build feel very solid. Even though most of the time the Studio 6|8 will be sitting comfortably in your studio, it’s good to know if can also handle a road trip or two. PreSonus has really given us a lot of flexibility and very thoughtful touches along the way. Around the back of the Studio 6|8 you will find a lot of goodies. I am very impressed with all of the ins and outs the Studio 6|8 provide and it sets this particular interface in a certain sweet spot for me as far as the overall utility. So from left to right you have the power supply input. The power supply is a “lump” in the line type which is somewhat better than a strict “wall wart”. The power is needed to feed the hunger of the wonderful on-board mic preamps. Next you have the power switch above a 9 pin DIN connector that connects to a breakout cable hosting MIDI In and Out as well as SPDF In and Out. Of course you have to have a way of connecting to your host computer and that comes in the form of a USB 2.0 B type connector. On down the line you have LINE OUTPUTS 3/4, MAIN OUTPUTS 1/2, COMBO MIC/LINE INPUTS 3/4 and last but certainly not least your faithful HEADPHONE jack. PreSonus has taken the same amount of care on what’s inside as the outside. The digital converters boast a very nice 114db dynamic range. You are not just given 2 but 4 (yes 4) of their XMAX Class A mic preamps which will give you amazing results when they meet your studio’s microphone cabinet. This is all being pushed to and from through a very high performing USB 2.0 interface. Well while all of this has sounds pretty great on paper, where it really counts is taking the Studio 6|8 out of the box and see what this baby can do. The primary function of an interface like the Studio 6|8 is serve as sort of the audio hub if you will of your production studio. 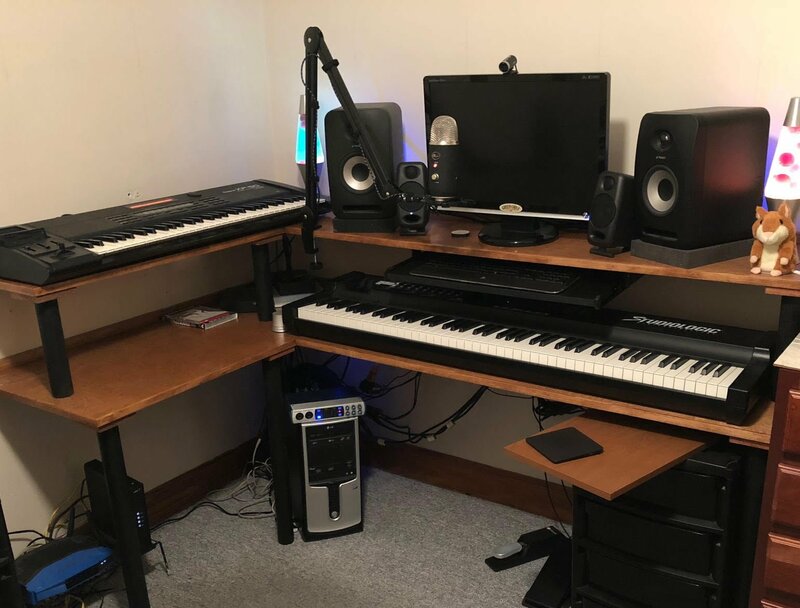 I have been going through shifting things around in my production room but no matter how you configure it the Studio 6|8 fits right in and can adapt to your individual situation. You can see I have it sitting on the top of my CPU tower. Having it there was convenient to make all of my connections and still have easy access to the controls. You can see I am using a Studiologic SL-880 controller and Cakewalk SONAR Platinum as my DAW currently (an entirely different story to be told). You will also see my trusty Roland XP-50 to the left. If this is your first experience with an audio interface the Studio 6|8 includes STUDIO ONE ARTIST and a very generous supply of plugins to get you started. PreSonus’ flagship DAW Studio ONE has continued to improve and innovate and has become the DAW of choice for many and an upgrade path is available for users of Studio One Artist. My typical workflow is to work mostly in the box and working with software instruments audio latency and stability is most critical. My current CPU is a 3.4ghz Intel i5 Quad Core with 32 gb of RAM. Using the PreSonus Universal Control application to talk to the interface I have had some instances where I pushed the audio buffers below 10ms and things still seemed to run smoothly. Having that performance in a USB 2.0 interface is very amazing. It tells me that PreSonus has been really working to ensure stable and low latency performance in the area of their hardware drivers. I have recently been doing some live television work with a worship team and band and wanted to keep things as simple as possible. This time I wanted to use my 2013 MacBook Pro 13″ Retina and see how that would go. With this setup I am using MainStage running Omnisphere, Pianoteq, HALionSonic 3 and Kontakt (yeah I know I am a glutton for punishment). Another thing I did was while using the Yamaha Motif as my controller I also wanted to leverage its sound as well. I took the stereo outputs of the MOTIF and plugged them in to rear inputs 3 and 4. I then assigned those inputs to a channel strip on MainStage so I could control the blend of the instruments from there, almost like a monster layer. The Studio 6|8 sounded so good. The overall sound is so clean and quiet. Having the front panel LED Meters was a big help as it allowed me to monitor the input from the MOTIF as well as the output signal I was sending to the control room. Overall a big win! I had recently purchased a pair of IK Multimedia’s iLoud Micro Monitors (which are scary amazing, more info here) and was trying to figure out how to incorporate those into my setup. For the life of me the name itself STUDIO 6|8 had me puzzled until I had an interesting idea on how to utilize the S/PDIF outputs. I had a surprise in what I discovered. For around $12 on Amazon you can pick up a very small Digital to Analog converter box. 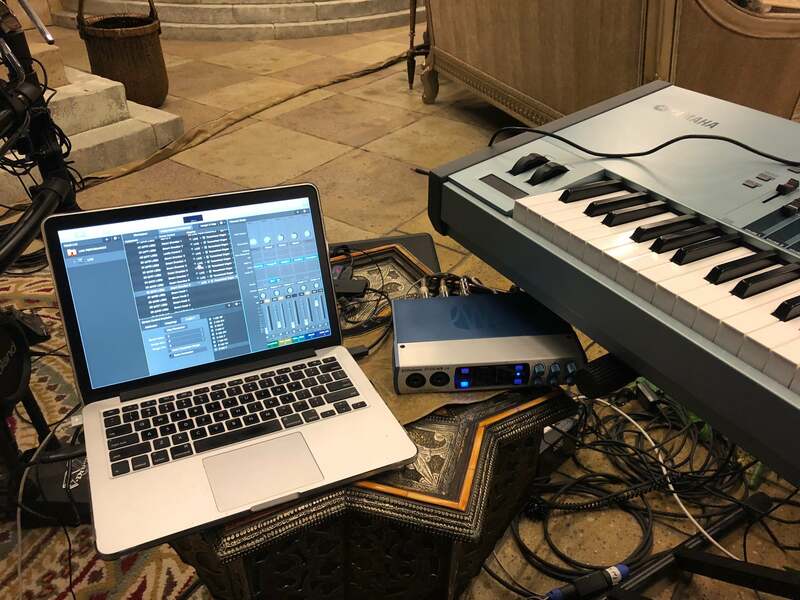 The S/PDIF output of the Studio 6|8 worked great with this and allowed me to connect my iLoud Micro Monitors without any hassle whatsoever and the sound and performance were excellent. I am wondering if there is another magic box that will let me go analog to digital? Now your mileage may vary but it is fun to try things. 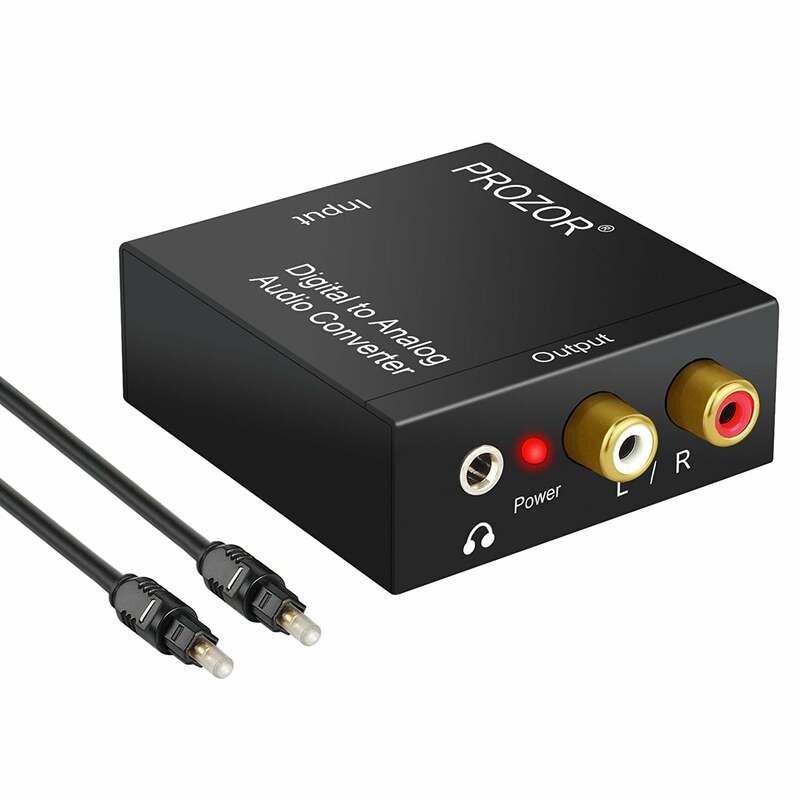 The connections can also be used to capture audio to and from other devices supporting S/PDIF including your computer, DVD/CD or even another Studio 6|8. Well after using the Studio 6|8 for a few months I can say without reservation that PreSonus continues to raise the bar starting from the rock solid, road worthy build all the way through to the high performing audio features. Plenty of inputs and outputs allow it to fit into the a wide range of potential setups and to top it off the $299 price point sort of takes you by surprise as you would expect to pay more for this much quality and utility. After using one of PreSonus’ AudioBox USB VSL22 interfaces (which is also a great box) I think I have to say I will not be sending the Studio 6|8 back to PreSonus (they have my credit card info). If you are on the fence about what interface to purchase for a first time user or you are replacing an older interface, my feeling is that you could not go wrong in choosing the Studio 6|8. There are also a few other models on the other sides of the Studio 6|8 from the Studio 2|6 all the way up to the 18 input/output Studio 18|24. No matter which one you choose you will be sure that the years of quality innovation, attention to detail and a reputation of meeting and supporting the needs of their customers will confirm you made the right decision. Respect? Yes respect and lots of it for the PreSonus Studio 6|8. The Studio 6|8 is available now from your music retailer of choice and lists for $299. More information can be found by visiting the official Studio 6|8 page on the PreSonus website.